Next year, celebrate New Year’s Eve in Style! New Year’s Eve can often be a bit of an anti-climax, repetitive or just plain boring. Next year, why not think about celebrating in style! Pop the champagne cork in one of these fantastic locations around the world. We take a look at the destinations around the world where they really know how to do it properly! 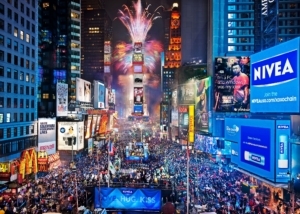 It comes as no surprise that New York City is considered to be one of the best places to spend New Year’s Eve – after all it is the city that never sleeps! Thousands of people will head to Times Square to watch the famous glitter ball being slowly dropped, along with a ton of confetti as they count in the New Year. New York City is also well known for its celebrity guests and this year is no different as Mariah Carey will be performing. If however you did not fancy spending your New Year’s Eve surrounded my thousands of people, you can also enjoy a boat cruise where you can watch the fireworks and at the same time enjoy a panoramic view of Manhattan. Personally – both options sound awesome – I need no excuse to visit New York more than once. 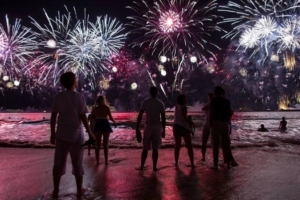 The award for the world’s largest New Year’s party goes to Brazil. The vibrant festivities take place on the beautiful beaches of Copacabana Beach. Over 2 million people travel to join the party, dressed in white. For fireworks, party atmosphere and the ultimate beach party – look no further! Accessories of red, green and yellow are worn as a celebration of romance, good health and prosperity. This amazing spectacle is all to celebrate the goddess of the sea. Dance the night away to the Samba rhythms! One of the first to celebrate the new year, Sydney is well known for its spectacular firework display over the iconic bridge, and the backdrop isn’t too bad either! 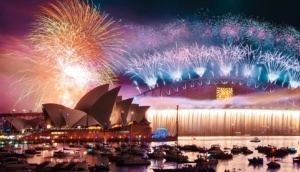 Australia is where many people go to travel, so New Year’s Eve is definitely a time where everyone comes together to see in the New Year with old and potential new friends. In Sydney, you can see mini-light shows, a lighted boat parade and join the dance party held at the famous Bondi Beach. Like New York City, you can also enjoy a boat cruise to see in the New Year and watch the fireworks. What makes Australia great at this time of the year is the heat. While the northern hemisphere shiver while waiting for the new year, Australians can enjoy the sunshine with a delicious Aussie barbie on the beach. Paris – The city of love. Love is certainly in the air on New Year’s Eve as everyone comes together to enjoy the beautiful firework display with the Eiffel Tower as the backdrop. 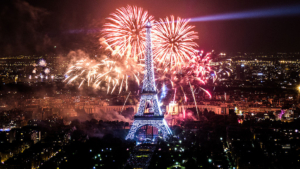 Paris’s streets come to life with incredible parties, especially around the Sacre-Coeur in Montmartre – definitely somewhere to visit if you are lucky enough to be spending New Year’s Eve in Paris. However if you fancy doing something a little bit different, you can go and watch a show in the theatre, such as Moulin Rouge, or travel along the Seine in a boat – very romantic! 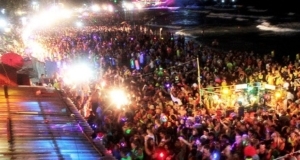 Famous for the incredible full moon parties held on Koh Phangan throughout the year, this famous Thai island turns it up a notch for the New Year’s Eve party. This party is certainly not for the faint-hearted, but if you are looking for the ultimate party, look no further. Dance on the beach and watch the live fire shows until the sun rises. What is even better is that now there is a small charge for visitors to join the party, the local community now have the resources to ensure that the clear up the day after runs smoothly. See in the new year with sand between your toes, overlooking the stunning ocean. Got more ideas? Get in touch, we love hearing travel recommendations! Make travelling more your new year’s resolution and experience these parties first hand. For travel ideas throughout the year, get inspiration from our website. Whether you want to spend 2018 on a snowy mountain or a sun-soaked beach, we have plenty of adventures for you to choose from. Make 2018 the year of travel! Next Post Alysha&#8217;s Adventure in Australia &#8211; Part 2!